Ho Chi Minh (formerly Saigon) is the entry point to Vietnam from Manila, Philippines. Looking at every traveller's album to Ho Chi Minh almost always covers a trip to Cu Chi Tunnels boasting how tiny the tunnels were, a story to be told on how they outwitted the Americans during the war. However, it doesn't appeal much to me and to my travel buddies. 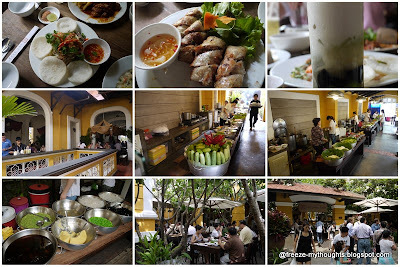 So we set out an itinerary to explore Vietnam sans Cu Chi Tunnels. On board Cebu Pacific, we arrived in Ho Chi Minh, Vietnam almost midnight. Since we could not find any money changer selling Vietnamese Currency: Dong, back home, we had to exchange at the airport in Ho Chi Minh. 100 US dollars is equivalent to 20800 Dong. Since we did not arrange for airport transfers and the airport taxi counter was already close, we had to proceed outside and find a taxi. 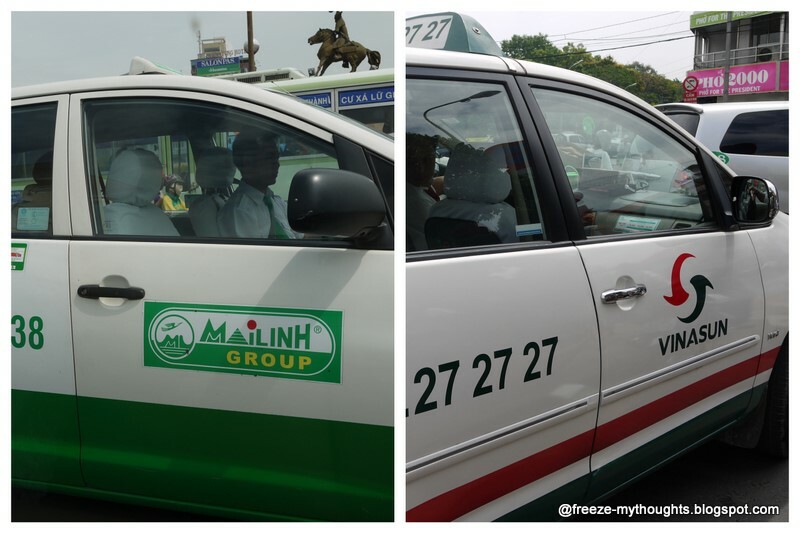 Several taxi drivers were offering their service for $10, $15, $25... knowing that taxi drivers in Vietnam are notorious, we had to walk further and look for reputable taxi operators (as advised by wikipedia) like Vinasun and Mailinh. The taxi at the airport seems territorial since only the brand Saigon Tourist were able to park at the loading bay. We found one Mailinh taxi at the parking lot, and so we approached the driver. 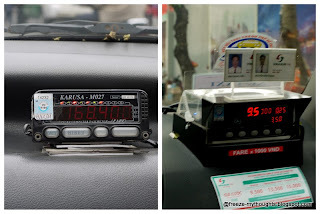 At first he was hesitant and pointed out to the taxi waiting at the bay; but we insisted we wanted his brand of taxi, and he agreed to take us from the airport to district 1 for $8 on his Innova. We were expecting $5 based on online reviews, maybe it has already increased; the $10 initial offer was actually reasonable. The city center is just 20 minutes away from the airport. At first glance, the city of Ho Chi Minh looks old. The buildings are noticeably run down, with narrow frontage, three to four stories high. The main streets are long, luckily, prepared as we are, we listed down the address, including the building number and printed out the location map of our hotel. Just like the rest, our hotel's frontage was narrow, there's a stairs leading to the lobby, while the first floor looked like a parking area. Hai Long 5 is a three star hotel that had fair reviews at agoda.com. It gets most positive reviews for its location. Since the reviews mentioned that the standard rooms are really small and may not have windows, we booked a deluxe room. The room was spacious, it has the essentials like aircon, tv, two single beds, safe, bathtub, free bottle of water and huge windows. We were on the top floor (9th) but the elevator stops on the 8th; we had to walk up one flight of stairs everytime. The bellboy was available to help us out with our luggage. There's an hour difference between Vietnam and Philippines, we had to cope up with sleep with our red eye flight and planned to sleep as we please but woke up 6 or 7 hours later since the sun was shining through our window curtain. We were bound for Central and Northern Vietnam; when we returned to Ho Chi Minh 7 days later, we also booked with Hai Long 5. However, we were bumped off and transferred to Hai Long 3. It was very taxing not having a room after a tiring long flight. They made up for it by paying for taxi transfers from Hai Long 5 to Hai Long 3 and upgraded one of the two rooms from standard to deluxe. The standard rooms were indeed very small. Overall, Tan Hai Long 3 turned out to be better than Hai Long 5. The common areas including dining area is more spacious; room flooring is synthetic wood instead of tiles resulting to better acoustics. Location was very near tax mall. After breakfast, we took the taxi to the War Remnants Museum. The fighter jets, tanks were on display outside. Inside were a number of photo exhibits, portraying the gravity of America's crime during the Vietnam War. In fact, they were found guilty of genocide by the Geneva Convention. Before we could finish looking at the exhibits, the bells starting to rang, the curators started to close the doors... it signaled that there were closing for lunch break and they won't be open til two hours later. And so we decided to leave. We took the taxi waiting outside the museum and asked to be taken to Nha Hang Ngon at Pasteur Street for lunch. On the road, we noticed that the meter was moving faster than usual and he seemed to be driving in circles. Our destination wasn't that far. I told him, your meter very fast and going around in circles. He didn't budge and said, one more turn. We had to pay 200,000+ dong which could have just be 20,000. When we got off the taxi, he called one of our companions and said that we paid him two 10,000 dong instead of two 100,000 dong and showed the bills. Since we haven't spent on anything yet, our companion had to recount the money left and insisted that she paid correctly; we didn't give in, the driver left. Later did we realize, that he pulled out two 10,000 from the visor before the stop and placed it near the shift and swapped it when we turned our back to get off the taxi. OMG, we could not believe these Pinoys were swindled by Vietnamese! We were swindled by the fast meter and we could have doubled that had we not counted our money. The 10,000 and 100,000 bills had similar colors and those zeroes can confuse every tourist. Inspite of the warnings we've read over at wikipedia and tripadvisor, we didn't heed to them and took a chance. 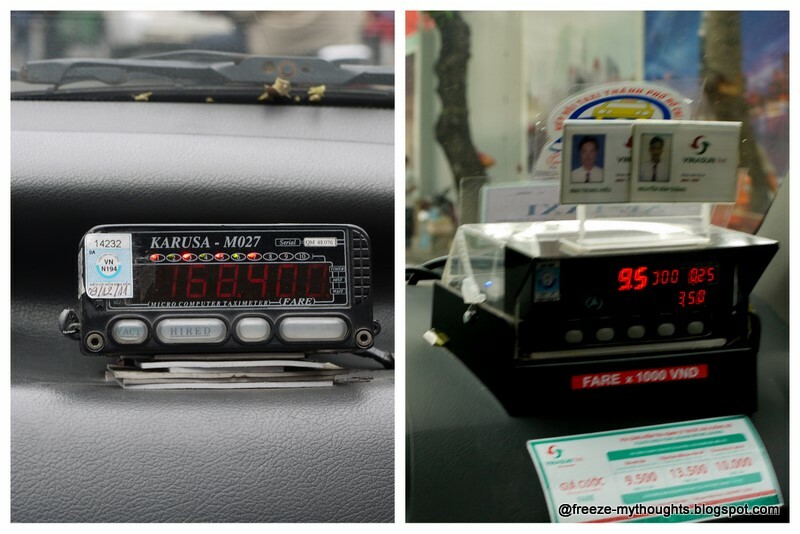 We learned it the hard way, so if you're going, hail Vinasun and Mai Linh taxi operators ONLY. First and foremost, you'd notice the ambience. Once you get in, you'll be escorted to a labyrinth of different food counters and nooks inside the three story open air French like building painted in bright yellow. We had to share the long table with another group. The menu had a long list of Vietnamese Cuisine; the problem was, we know little about Vietnamese food, we had to look around our neighbors' tables. Most of the locals are eating its signature Pho (Vietnamese noodles), pancake, spring rolls and a drink prepared similarly to our halo-halo. After a walking the whole afternoon around Ho Chi Minh, we sat at Highlands Cafe, a popular chain of coffee shop across Vietnam, surfed the internet with it's free wifi and enjoyed some fresh juice, coffee and a serving of great Vietnamese Coffee Cheesecake. 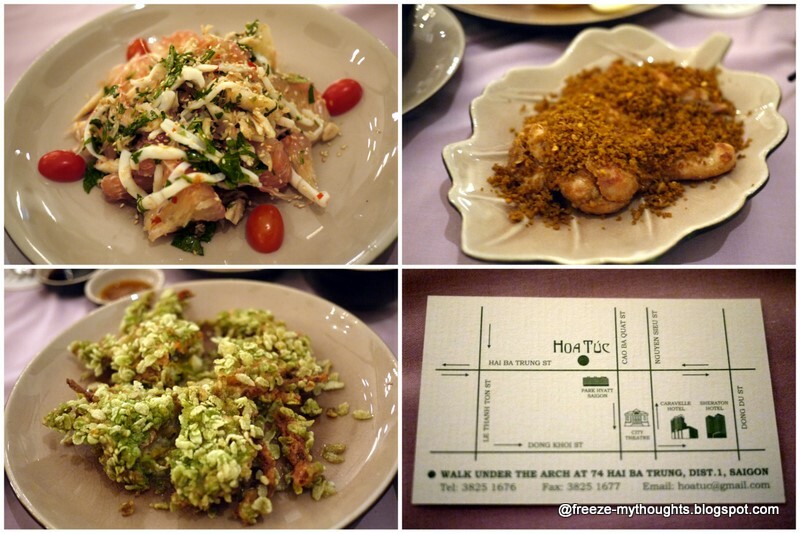 Hua Tuc ranked second in tripadvisors' restaurant pick. The pomelo salad was great, the shrimp was generously covered with fried garlic, the seabass wasn't good and the soft-shell crab with cereat batter wasn't my type. It was a million dong meal for four pax, the soft-shell crab was pricey! Beside Hua Tuc was a couple of other interesting restaurants and bar to hang-out in. 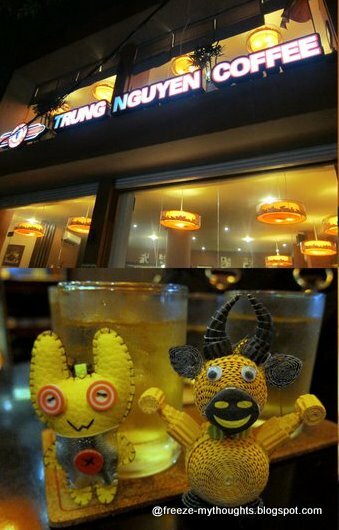 Also a popular chain of coffee shop across vietnam, although the branch across Tan Hai Long 3, where we hang out was not in tip top shape. The place wasn't well maintained. 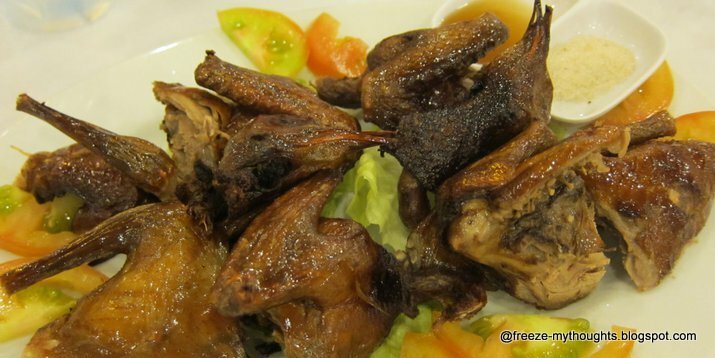 After a week of eating Vietnamese food, there's nothing like going into a Chinese restaurant for some comfort food. The first thing I noticed was the pigeon hanging by the window, the second thing is the number of people going in and out of this restaurant. If there are too many locals, it must be good. After lunch, we took a taxi to Ben Than Market and spent little time inside since we did not find anything interesting. Those northface bags looks very fake. We went out and walked towards Rex Hotel, the city hall and made stops at different retail stores along the street. We also went sight seeing in Notre Dame Cathedral but refused entry inside, to the post office next to Notre Dame Cathedral (the nicest post office I've ever seen) and Opera House. In between places, a taxi ride costs about 20,000 dong; flag down rate varies on the size of the taxi from 9.5 to 11 dong. 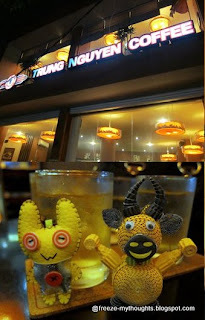 Not satisfied with the (shopping) stuff we've seen, we googled for more information and learned about Saigon Square. Here, although the place wasn't huge, we finally found what shopping in Vietnam is like. You can find Zara clothes, Crumpler Bags, Northface bags and jackets... they aren't exactly imitation nor fake. If you ask them, they'd say "original material". We met a byahera buying a load of northface bags and explained that these are made of original material, technically stolen by factories or subcontractors. The kiplings are definitely fake she said since they are not manufactured in Vietnam; but the crumpler, northface, nike bags are real but there are fake ones too. It pays to know the difference, do you? I don't. I bought a crumpler equivalent to 750 pesos and a northface rain jacket for about two thousand pesos. I could have shopped more, but I didn't have enough luggage space, uuh... i mean, I didn't have enough baggage weight allowance. I just bought 2 units of samsonite b-lite at the Tax Mall which is 30% cheaper than the retail price in the Philippines. With this samsonite b-lite, I definitely would not have to worry about baggage weight next time. International excess baggage costs $40 per 5 kilos! from the entrance, go straight til the end then turn left, the crumpler and northface products are here. If there's one thing about Ho Chi Minh (or anywhere in Vietnam) that keeps our spirits up, it is the challenge of crossing the streets of Vietnam. The streets of Vietnam is definitely not pedestrian friendly. Even for someone who grew up in downtown where drivers does not yield to pedestrian, it was tough! One has to look left and right and left and right then left and right again, those motorbikes just comes out of nowhere and does not yield to pedestrian or opposite traffic even if the traffic light is red. conical hats, still a common sight. Explore Vietnam: Central and Norther Vietnam coming up. thanks for the tips! going to vietnam this january. very handy tip re taxis! you're welcome rye. hope you will have a pleasant vacation in vietnam.